Hands up if you thought mining for various precious metals would never cement itself as a theme for online slot machines; if that’s you then you’re almost certainly not alone and no-one would blame you for thinking that way. The big surprise is that not only are there more than a few mining slots, there are enough from which to pick a top five. 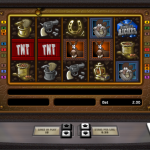 Below we present the gold and gem-fuelled slots which have kept us busy in the recent past. 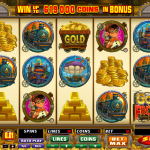 Gold Factory is Microgaming's effort at a mining-themed slot and a good one it is too - the industrial feel to the game, the quality of the gameplay and the variety of bonuses mean it's an obvious choice for our top five list. Click here for the full review. Randall's Riches is one of the few slots we've reviewed from Realistic Games and it introduces to us the character of Randall, a cheerful-looking snake overseeing the mining efforts. A number of bonus features and some genuinely high quality graphics make this a winner. Click here for the full review. 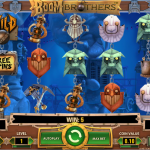 Boom Brothers is from Net Entertainment so something creative is expected and that's what you get; the bonus feature is like a mini arcade game but there's also some free spins and a notable base game feature which can respin one of the reels. Click here for the full review. 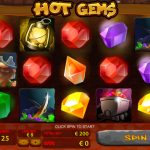 Hot Gems is a colourful slot from Playtech which makes it onto this list because of it's high quality graphics and collapsing reels feature which is like getting a free spin for nothing. Click here for the full review. 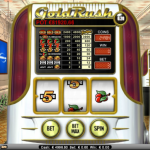 Gold Rush is something a little different from Net Entertainment - it's the only three reel slot in this list but it's so beautifully designed all slots fans should enjoy it. A progressive jackpot is the icing on the cake. Click here for the full review.